John Kenneth Muir's Reflections on Cult Movies and Classic TV: Breakaway 2018: "Guardian of Piri"
In “Guardian of Piri,” Earth’s traveling Moon encounters a new and strange world, which Victor Bergman (Barry Morse) mysteriously designates “Piri” during a command conference. Before long, Alpha’s computer begins to make catastrophic errors regarding the base’s internal operation too. Professor Bergman faints after Computer recalibrates the oxygen in the base’s air-supply, without heed. Later, another Alphan, Sarah Graham, dies when Computer stops a blood-transfusion in mid-operation. Commander Koenig (Martin Landau) believes that David Kano (Clifton Jones), head of Computer Section can help determine why the machine has gone “haywire.” Several years earlier, David undertook a dangerous experiment to link computer memory with the human brain, and now he and Koenig believe this link-up might help pinpoint the problem. Instead a force spirits Kano away from Alpha when link-up is made. Koenig travels to Piri in an Eagle, and sees that the Eagle pilots and Kano have become mindless drones on the strange planetary surface. He encounters a beautiful woman (Catherine Schell), who identifies herself as the Servant of the Guardian of Piri, and reports that her purpose is to take “transient, imperfect” human life and render it “perfect.” She also reports that the Guardian has stopped time, because absolute perfection is eternal. In blunt terms, “Guardian of Piri” is a story about the ways that technology and automation can be dehumanizing influences. 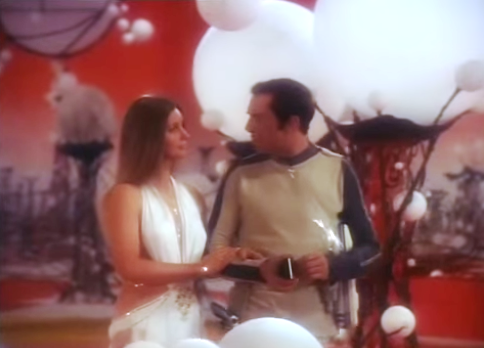 Space: 1999 writer Johnny Byrne told me during an interview that the Gerry and Sylvia Anderson series grapples explicitly with the notion that technology is a double or two-edged sword. Technology gives us something, but also takes away something else. 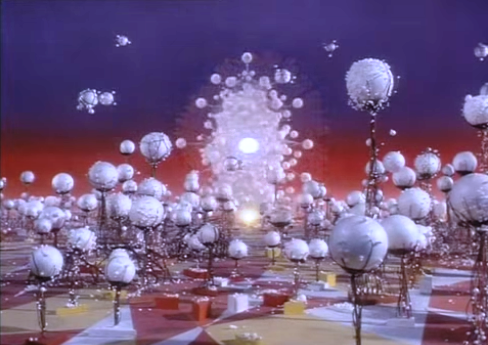 Johnny was talking, specifically, about “Matter of Life and Death” when we had this discussion, but he could have been discussing Christopher Penfold’s visually dynamic and thematically resonant “Guardian of Piri” as well. “Guardian of Piri” has fascinating origins in Greek Myth. In Homer’s The Odyssey, Odysseus was desperately attempting to return home to Ithaca following the Trojan War, but along the way encountered the sirens. These inhuman beings had a tantalizing call, one both irresistible and sexual in nature. Odysseus had himself tied to the mast by his crew so he could hear the song, but not heed the call. That’s how powerful the siren song proved to be. 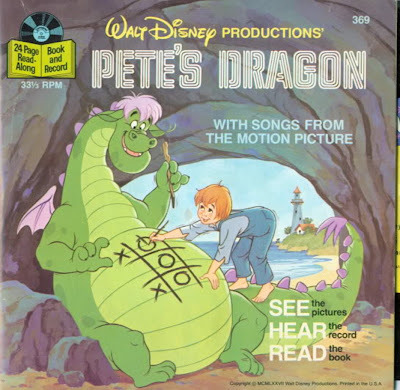 In “Guardian of Piri,” the Guardian and its servant are created very much in the fashion of the mythical sirens, drawing the Alphans and even Computer to the planet surface.Yet importantly, in this case their song is not overtly sexual (though the episode’s final act features strong sexual overtones...), but rather technological in nature. Specifically, Piri promises a paradise in which machines will tend to every human need, and humans will be left to their leisure. Even the day-to-day matters of “sustenance” will not interfere with human pleasure, as Helena asserts at one juncture. What makes all that pleasure possible is the toil and custodianship of the Guardian. Uniquely, “Guardian of Piri” suggests a continuum in term of dependence on technology (specifically machines or computers). The Alphans represent an early but still dangerous point on that particularly graph. They “believe what the lousy computer” tells them to believe, and thus nearly lose an Eagle crew. Similarly Koenig notes that there are simply not enough personnel to run the base on manual control. The Alphans are overseers of their technology, but they cannot regulate every function on Moonbase Alpha. Sarah Graham dies because her blood transfusion -- considered a routine computer-controlled process --went unobserved by human eyes. “I am not a computer,” Dr. Mathias (Anton Phillips) declares angrily, and his suggestion is that Medical Section is unmanageable without Computer’s custodianship of it. Koenig starts to suspect that this dependence on Computer, while necessary, is having ill-effects. “That computer seems to be telling us exactly what we want to hear,” he observes correctly. Indeed it is, because the computer has heard the song of Piri and is now in thrall to the siren...the Guardian. The Pirians meanwhile, stand at a later point on the same continuum, or more aptly, its end point. The (ostensibly humanoid) Pirians thus abandoned every responsibility they had, even those pesky matters of day-to-day sustenance, in favor of pleasure. But a people that didn’t build anything, didn’t exert themselves, and couldn’t be bothered, even, to feed themselves became...apathetic. In the end, as Koenig realizes, they died. They could not thrive in a computer’s idea of paradise. Late in the story, Koenig stumble on the antidote to this mind-numbing apathy: pain. He punches a monitor in Main Mission and cuts his hand. The Servant offers to heal it for him but he objects: “Leave me with my pain. It reminds me I’m human.” Then he descends to Piri and puts Helena through shock treatment to rouse her from her trance of apathy. The message seems to be that some amount of suffering, or pain (the opposite of pleasure) is necessary if human civilization is to thrive. 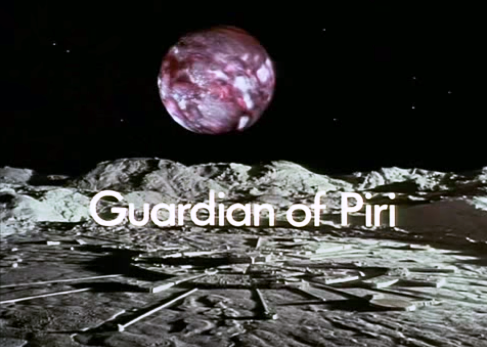 One of the most fascinating aspects of “Guardian of Piri” involves the episode’s ending. By destroying the “moment of perfection” created by the Guardian, the Alphans actually restore natural (rather than machine life) to the planet’s surface. They were brought there, essentially, to die in a computer's vision of perfect bliss. Instead, they upended the machine’s vision and imposed a sense of order more in keeping with human biology. Too bad, as Koenig says, that they didn’t stay. 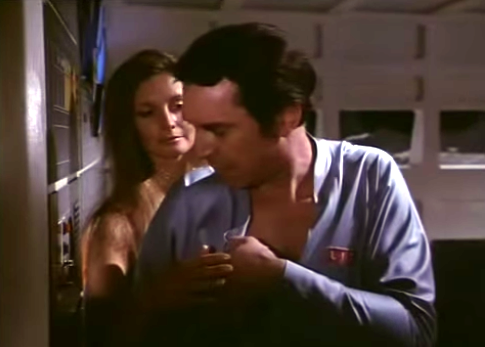 As I noted in my book, Exploring Space:1999, several episodes of the series involve the Alphans acting as catalysts, bringing new life or resurrecting dead life on alien worlds. In addition to their catalyzing actions in "Guardian of Piri," the Alphans help Arra to evolve in "Collision Course," and bring the seeds of life to Arkadia in "Testament of Arkadia,"
Beyond the plot line, which suggests a futuristic siren call and a computerized version of paradise, “Guardian of Piri” thrives on its amazing and uncanny visuals. In all of science fiction television history, there has never been another world that looks like Piri. It is unique. The planet’s surface is a strange, technological forest atop a rocky plateau. 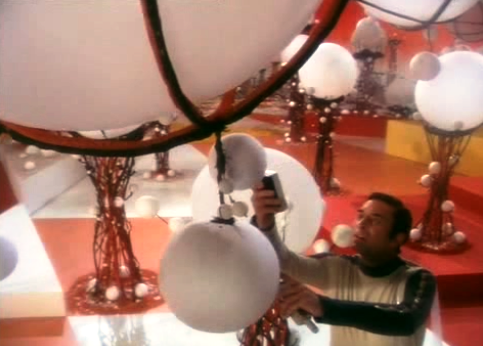 In the forest, the trees seem to be wrapped in wires bundles instead of organic vines, and instead of leaves, there are giant mechanical white bulbs everywhere. his set was built in miniature and in live-action proportions, and remains, as noted above, absolutely singular in appearance. As one Alphan notes, the planet is a “weirdy.” But an unforgettable weirdy. 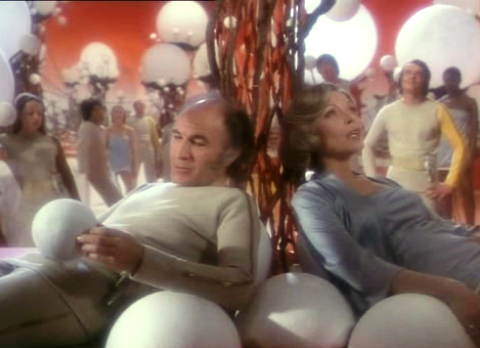 This episode always reminds me why I admire Space: 1999 to such a degree. Its visual presentation is downright stunning, and often incredibly original. Spectacular is probably the right word. And this episode gives us the spectacular Catherine Schell as well, strolling among the strange wiry trees of Piri, suggesting a distant world both alluring…and utterly alien.